The Joint Oireachtas Committee on Health was told today there is an urgent need for the link between ill health and homelessness to be recognised. AN OIREACHTAS COMMITTEE has been told a young mother from the midlands “would not be dead” if she had been able to access drug treatment in her area. Represesentatives from homeless services today told the Joint Health Committee that there is an urgent need for the government to recognise the link between homelessness and ill health, and to treat addiction as a health issue. Dr Austin O’Carroll from Safetynet, a healthcare service for homeless people, gave an example of a young mother from the midlands who came to Dublin to get methadone treatment as it was not available in her local area. He said she was doing well, but had to stay in a hostel in Dublin whenever she came to get her prescription. One night, she was “violently assaulted” in a hostel and due to the depression she suffered after this attack, she ended up back on the streets. “She died three weeks later of an overdose,” he said. If she had got treated down the country she would not be dead. His colleague Dr Fiona O’Reilly also spoke of people in homelessness who have “died waiting for methadone” treatment. “It’s unacceptable,” she told the committee. Service representatives said drug treatment should be available locally and immediately and should be catered to the individual’s specific needs if it is going to work. Niamh Randall, head of policy and communications for the Simon Communities told the committee that people who are sleeping rough or in emergency accomodation are much more likely to use drugs in unsafe ways and in greater quantities. She said there is no aftercare housing for people who have successfully completed drug treatment - they are often back in homeless hostels or sleeping rough afterwards. Niamh Randall told the committee people sometimes have nowhere to go after they finish drug treatment. Randall also said it is vital that there are no preconditions to people accessing housing – being an addict should not preclude a person getting a roof over their head. Austin O’Carroll told TDs and Senators the main causes of homelessness and addiction are poverty and inequality and dismissed the idea that it comes down to bad choices in people’s lives. He said people living in poverty “see drug addiction as a way of treating the trauma” in their lives. “It’s not a choice at all,” he said. 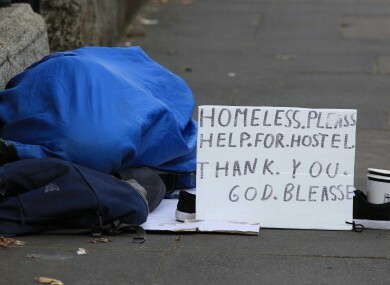 One man who has been living in a tent along the Grand Canal in Dublin for over a year started on methadone and within six weeks he has stopped living there, has moved into accommodation and has stopped using heroin. In contrast, Dr O’Reilly spoke of one patient who has a drug addiction that has been “out of control” in the last three months since he has been living in a hostel. In just one week recently, he had three overdoses and needed to be revived with the opioid-overdose antidote naloxone each time. The committee also heard how physical and mental illness can push people into homelessness. One woman who used Safetynet’s services is suffering from depression. She is a single parent in her 20s and is “not coping with managing the household expenses”. She failed on one rent payment and is to be evicted this week. Typical health services can sometimes be inappropriate or inaccessible for homeless people and other vulnerable groups, the committee heard. O’Reilly gave the example of a woman called Julie, whose right leg was “completely swollen from foot to groin”. It has been like this for six weeks, she has had a deep venous clot in the past and it is likely she has another now. She knows this could block off an artery and cause instant death and she has been referred twice in the last six weeks to the Emergency Department but has not gone. Dr Fiona O'Reilly said health services need to be more flexible in order to reach the most vulnerable people. “Services need to meet people where they are at,” she said. Her colleague Austin O’Carroll gave an example of this patient centred approach they developed with staff at St James’ Hospital in Dublin. Safetynet had 40 people with Hepatitis C who he referred to the hospital for treatment. He told all of them this treatment was extremely effective and lifesaving. Still, 26 of them missed their appointments. Now the treatment is bring brought to them in their hostel. Representatives told the committee that the most effective treatment in these situations is the provision of a stable housing environment. They spoke out strongly against the reintroduction of bedsits into the housing supply. Niamh Randall said the last thing they wanted was to see vulnerable people “living in a very isolated situation” having moved out of homelessness. We need to look at what we’re building and what we’re providing. Building three-bed semi d’s all over the country is not the way to go. We need to provide for people at the different stages of their lives. “The State stopped building and providing social housing, we need to be very clear that is the solution,” she added. Email “Young midlands woman 'would not be dead' if local drug treatment was available”. Feedback on “Young midlands woman 'would not be dead' if local drug treatment was available”.